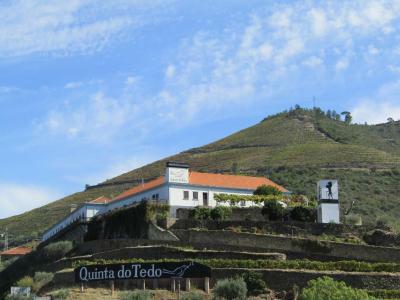 Lock in a great price for Quinta do Tedo - rated 9.4 by recent guests. Great location in Douro valley on a road 222 (if travelling by car take only this road going from Porto , especially starting from Peso da Regua). Quinta is not that big and has only a few rooms. We had a duplex (best of use for 2 people, there were 4 of us, felt a little tigh). Nice breakfast included in price. Really nice dinner (provided on high season started from April), but a bit pricey compared to restraunts in close villages (like Pinhao). Lovely views on the terrace, plenty of place to go on a walk/hiking. Great to come closer to harvest days in September. The view was stunning. The tour of the cantina was professional and the staff well-informed and passionate about the wine. The breakfast was very good — loved the fresh yogurt and delicious preserves. The Quinta was in a beautiful location, right on the Douro where it is joined by the Tedo River. The grounds were lovely. The large-windowed breakfast room had a great view of the Tedo River winding towards the Douro. We loved the tour of the wine making facilities and the port was excellent! The staff was super helpful and friendly. very good breakfast, amazing view, nice walking path around the quinta, tastting of porto including in the price. Everything!! This Quinta is exactly as presented in the photos....a little slice of heaven. Breath taking views, amazing accommodations, friendly and professional staff. We arrived and were immediately welcomed with a refreshing glass of chilled rose port, nice touch. The Vineyard staff were in full production mode but they still took the time to answer all my hubbies questions about the grapes and their processes. These are the gentlemen handling the wine making, not the tour guides! We also had a tour and wine tasting offered with our room. The breakfast was so delicious. Fresh baked bread, excellent coffee with steaming hot milk, local artisan jams along with cheese, ham, cured prescuito. And the best part was the view! I've never stayed in a place like this one. I had a nap in a lounge chair next to the pool overlooking the Rio Tedo whilst in the shade of a huge fig tree. Honestly I felt like I was living the lifestyle of the rich and famous. Nice location and excellent port. The staff and owner were extremely friendly and helpful. We really enjoyed our stay and morning walk through the vineyards. Beautiful Quinta, superb wines, friendly staff and owners, bikes, kayaks local walks. Excellent. 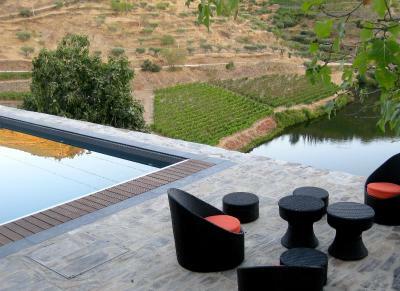 This award-winning wine tourism bed & breakfast has an outdoor swimming pool and is inserted in an ecological reserve, set at the convergence of the Douro and Tedo rivers. Tours of the Quinta do Tedo and wine and olive oil tastings are provided. The 5 air-conditioned rooms boast views of the river and feature a fan, a minibar, a flat-screen satellite TV and a private bathroom with free toiletries. In the swimming pool area, guests will find a terrace with views. A continental breakfast is included and served each morning at the property between 8:30 and 10:30. Quinta do Tedo also offers a restaurant that opens between 12:30 pm until 18 pm and from 19 pm until 22 pm from March 15 until October 31, where guests can enjoy a meal and taste local wines during summertime. Guests of the Tedo can relax and enjoy a swim in the outdoor swimming pool, which has views over the valley and the Tedo river. Free bicycles are provided, for guests wishing to tour the region in a leisurely fashion. An array of activities can be enjoyed in the surroundings, including hiking, canoeing and bird watching. The property provides canoes and binoculars for free. Vila Real is 27.3 miles from the unit. Viseu is 49.7 miles away. Porto International Airport is a 95-minute drive from the Quinta do Tedo. This property also has one of the best-rated locations in Folgosa! Guests are happier about it compared to other properties in the area. Quinta do Tedo has been welcoming Booking.com guests since 31 Jul 2014. When would you like to stay at Quinta do Tedo? The air-conditioned rooms feature a flat-screen satellite TV and a private bathroom with free toiletries. The rooms open to the patio and are air-conditioned. 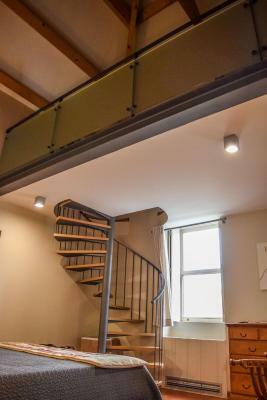 This double room has a private entrance, minibar and air conditioning. House rules Quinta do Tedo takes special requests - add in the next step! Quinta do Tedo accepts these cards and reserves the right to temporarily hold an amount prior to arrival. Please note that the property does not have a 24-hour reception, so check-in and check-out times must be confirmed. For different arrival times, please contact the property. In early spring, it can be quite cold. Despite the heating, the room remained cold. The location is absolutely beautiful. If you have time, you should go for the walk around vineyards. It's not that easy and should be wearing sturdy shoes. Breakfast is generous, the WiFi excellent. - Lots of tourists comming for wine tasting on weekends. On Sunday morning quinta was crowded (2 full busses and 2 mini busses on Sunday morning for 1,5 hour tour and tasting), felt really crowded - Wine tours are not that great compared to the ones in Porto on the other side of the river. But thats only if you have something to compare with. Overall - really nice experience. The room is well equipped, friendly staff. The breakfast is awesome! The Quinta itself is not big, i like the wine tour. We stayed just a week or two into the 'off-season' and because of that, the restaurant was closed on our specific days of the week (Tues & Wed) so we had to take an expensive taxi to a "nearby" restaurant for dinner. This is really not a complaint about the Quinta, but it caught us a bit by surprise and good for travellers to keep in mind for those staying in the fall and winter season. Stunning view! Gorgeous place to stay. Breakfast was so peaceful. My husband and I enjoyed a fabulous two-night stay at Quinta do Tedo. Our room was beautifully appointed and included a very spacious, modern bathroom with a large window that overlooked the property's peaceful pool area. Our queen bed couldn't have been more comfortable, and we slept perfectly, enjoying the quiet of this picturesque, rural area and the light breezes that entered through our screened bedroom window (no bugs and lots of fresh air!). We had ideal weather during our stay, so we used one of the Quinta's tandem kayaks to explore the tranquil Tedo River, and we also enjoyed walking along the river's edge via a rural road on the property. We started each day with a delicious breakfast of ham, cheese, fresh local bread, yogurt, juice, and coffee, and before our afternoon tasting tour, we enjoyed some delicious small bites in the Quinta's bistro which has floor-to-ceiling glass and offers guests outstanding views of the Quinta's beautiful surroundings. Proprietors Kay and Vincent Bouchard were wonderful hosts, and the Quinta's staff were happy to answer our questions and make our stay as comfortable as possible. We highly recommend Quinta do Tedo to anyone who would like to stay at a picturesque, very relaxing, and centrally-located spot in the stunning Douro Valley! The restaurant food was good but seemed to be static menu. Varying the menu during the week may encourage more people to eat multiple times during their stay. Beautiful location, great service, very nice room, great port, free use of boats and bikes. What's not to like?? Best thing about the place are the owner's three very chilled out dogs that spend their time gazing out at the view. The swimming pool water was not crystal clear, but i guess it would be very difficult to keep it that way since there are lots of trees and flowers around. It was difficult driving in that area. The locals drive so fast as they are familiar with all the twists and turns. And driving uphill with no guard rails in most places whilst the river downwards is only a few feet away! You got to have nerves of steel. We also found it hard to find a decent place to eat in town on Sunday as mostly everything shuts down. But that's not the Quintas 's fault at all.